Instantly turn any window into a kitty entertainment center! The ingenious EZ Mount Kittyface Window Bed™ attaches to virtually any window in seconds utilizing our proven suction cup mounting system. 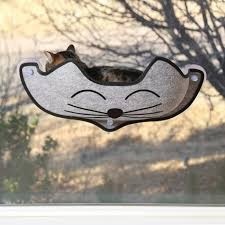 Completely open at the top, this half pod design gives cats easy access to climb in and out. Included is our soft, warm and cushy Amazin' Kitty Pad™ for hours of snoozing and watching over the household. One year limited warranty.